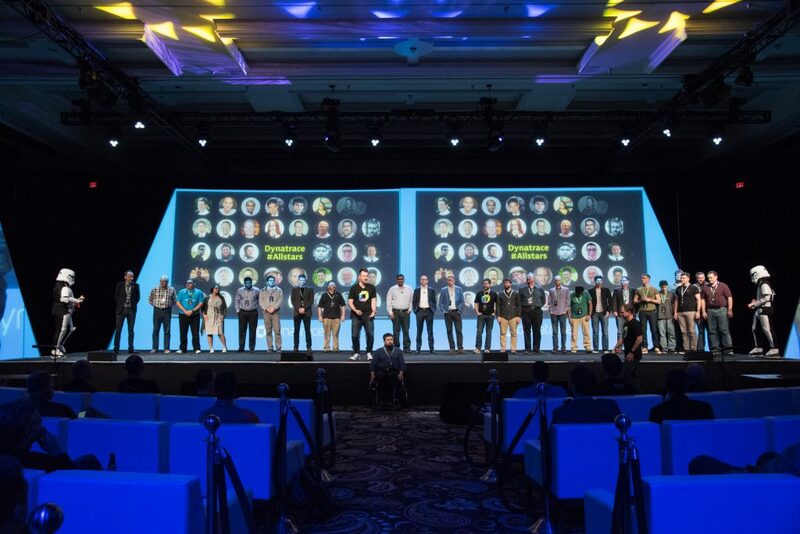 As we begin the countdown to Perform 2019, I reflected on our ‘sneakers for speakers’ All-Stars Program that has taken off like free giveaways at an AWS event, since its first appearance at Perform 2018. 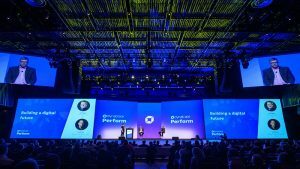 We came up with the idea that we would have Dynatrace All-Stars as part of our Perform Event Series last January, as a ‘reward program’ for our customer advocates and a chance for us to demonstrate our gratitude to them. Since then, it has created somewhat a complimentary amount of chaos across the company. Recognize our customers for the time they have dedicated to being an advocate for the brand. Make it unique and make it scarce – it needed to be something that wasn’t readily available. Broadcast it. Find a platform, maintain social presence, and keep momentum. Having named the program ‘Dynatrace All-Stars’, there was really only one choice, right? We’d be giving away Converse Dynatrace All-Stars with our Smartscape and logo. Exactly two months before Perform 2018 kicked off is when the origin of these sneakers dates back to, with a tweet by one of our legendary SE’s Bill Zajac as he prepared himself (and quite literally geared up) for Perform. 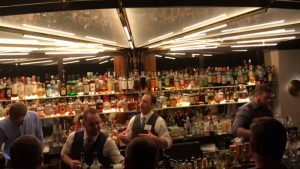 But that’s not the only place the roots of Dynatrace All-Stars stem back to. As the saying goes, “great minds think alike”, this was certainly the case for our program as our very own Head of Brand and Comms had the same great idea as she was brainstorming how to market the program ahead of attending AWS re:Invent 2017. And just like that, the program started. Slowly, but surely, we were on our All-Stars journey. We put our tenacious customer advocacy hero Hannah Lane on the case, and what happened next was nothing short of remarkable. After we announced the program at Perform, things really started to heat up. Through the sheer scarcity of the sneakers, and the overwhelming number of shared social posts, we soon go inundated with requests for a pair of our Smartscape Dynatrace All-Stars. Everyone from our sales team, executive staff and partners were asking for a pair, and during our sales kick-off day, I got so many requests for these sneakers I had to do my presentation shoeless, at the risk of the sneakers becoming a focal point. I did, however, announce to our sales team that if they got a customer to speak at Perform they too could get a pair. My inbox almost crashed with emails from sales, nominating customers. But the reactions that took us by surprise the most were those received from our board members. Never before have I seen – or thought I would see – our male board members, in particular, get so competitive over a pair of shoes. Speak at our major event series, Perform. Do a customer reference story. 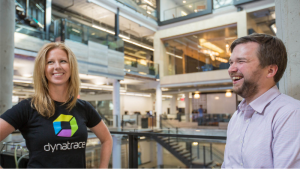 Be an advocate to partners, media, or colleagues to help promote the Dynatrace brand. 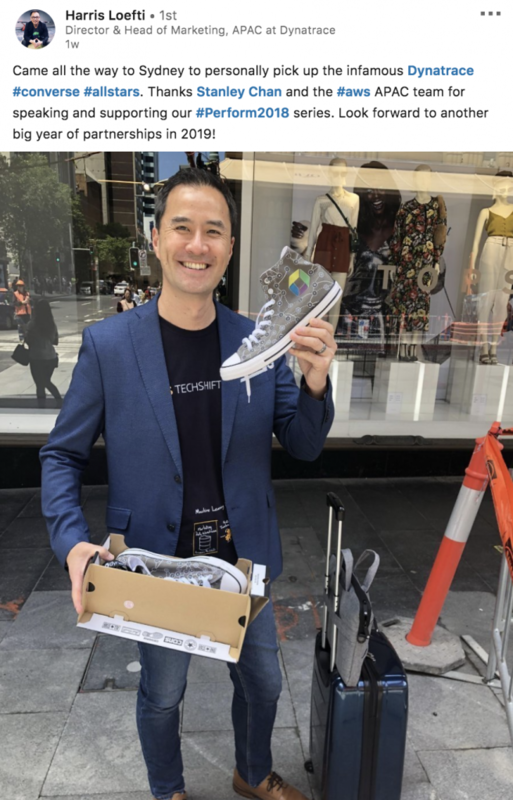 So, to bag yourself a pair of these exclusive sneakers you must really be – and act like – a Dynatrace All-Star. The secret to the success of this program is really about the scarcity of the sneakers, and the social presence this created. I also want to extend a huge thanks to Hannah Lane, our Customer Advocacy Manager, who has gone from helping to procure and edit our customer stories to becoming a shoe distribution powerhouse. 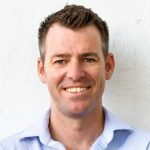 In the twelve months we have been running the program, we have exceeded our own expectations as we have seen our Dynatrace All-Stars laced up around the world; across Dallas, Philadelphia, Florida and even making it all the way to APAC in Sydney, Australia. 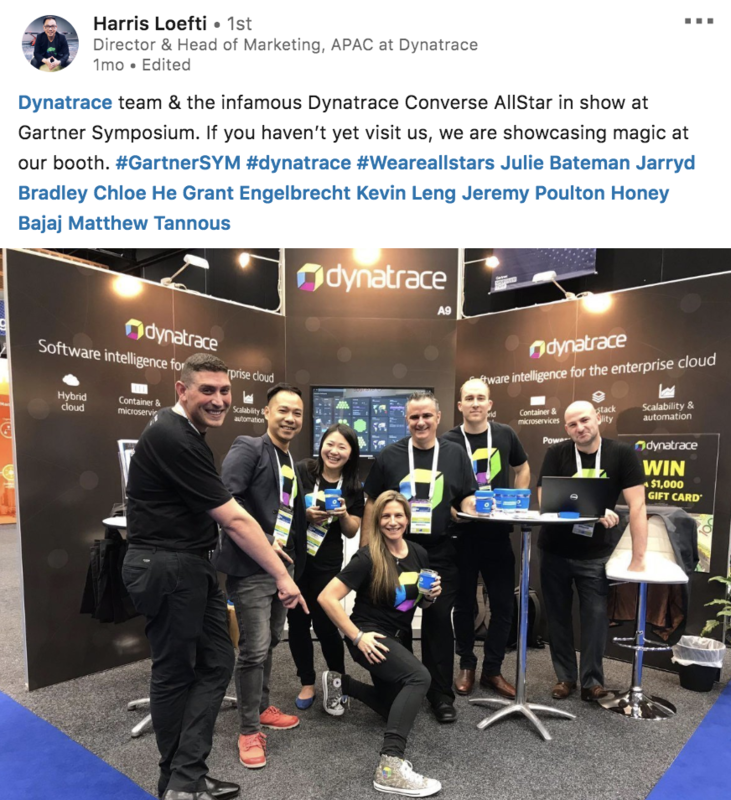 Here are just a handful of tweets and posts that showcase the fun of this program, and Dynatrace will be redefining All-Stars as well as software again this January so make sure you’ve registered to attend the show if you want to be in with a chance of receiving a pair of sneakers.